January | 2010 | Ooh, my favorite! A small few of us are blessed enough to do what we love everyday AND get paid to do it. I am not currently part of this exclusive club. In fact, I’m a not-so-proud member of the other extreme where I arrive for work everyday and feel my stomach tighten as I pull into the parking lot. With one big sigh I walk in seemingly slow-motion toward the doors, trying to shake away my mind’s flashes that somehow mistaken the double doors for the fiery threshold of hell. Sometimes, I even think I hear Marilyn Manson’s rendition of Sweet Dreams in the background. Dramatic? Most definitely. Completely and totally true? Sadly, yes. Now, that I’ve probably scared you away, please know that my intentions for this space are not to start a collection of whining and bitterness about work (although, I totally could!). Actually, my intentions are quite the opposite: I want this space to be filled with all of the wonderful parts of my days and weeks, and I want to share them with you! While I am doing what I can to get access to the do-what-you-love-and-support-yourself club, I have found food is the best remedy for a long commute back from hell everyday. I have a million favorite things to share, but for now I hope this can be a space where you can join me in my culinary adventures in the kitchen and around The Bay Area. I still have my culinary training wheels, but I hope that eventually I can trade up for a nice pink Huffy with the back-pedal breaks and a kick-stand! So, after all of that, I’ve got nothing for you tonight. Just back from Seattle, we’re pantry raiding and my sweetie is making me stroganoff. But hold tight and let’s see what we find at the farmer’s market this weekend! After a whirlwind trip to Seattle this past weekend, I managed to pick up a nice little head cold. Ugh, just thinking of all the microscopic monsters floating through the recirculated air is enough to make me cringe. I’m seriously considering wearing a face mask next time, but feel that it may be a bit dramatic—not sure I want to deal with all of the crazy stares from other passengers. Nevertheless, I had a great stay-at-home day and was able to catch up on some much needed sleep. When we arrived home yesterday afternoon we walked down the street for some Pho. It was definitely a Pho kind of day: cold, windy, rainy, with a dash of sniffles and a cough here and there. Sadly, I realized that I’m not really able to enjoy it as much as I used to; all I can think about are the mounds of MSG I’m slurping up in every bite, I mean, no matter where you go, all Pho tastes pretty much the same, so that’s got to be the common thread, right? So, since I had met my Pho quota for the month, I knew that if I wanted a nice hearty soup to round-out my perfect recovery day at home I’d have to make it myself. 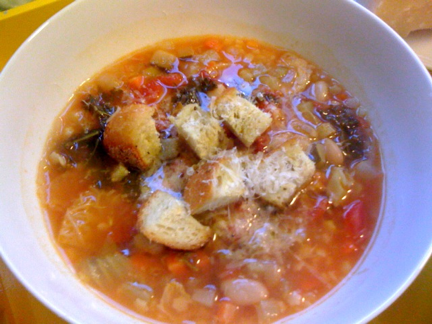 Luckily, I had everything I needed to make a great pot of Minestrone…thank goodness for the leftover veggies from detoxing last week! They all needed to be used, so in the soup they went. 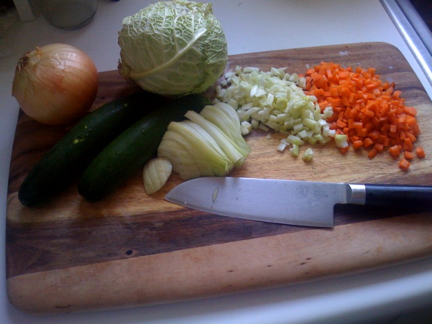 I make this soup often, and always switch-out a few of the veggies here and there depending what I have on hand: potatoes, cauliflower, and cabbage, are all great additions. For me, this recipe is more about ease (especially on a sick day), so I don’t usually splurge with homemade stock here, but if you have some on hand, it would only make it better. 1. Preheat the oven to 350-degrees for the parmesan croutons. 2. Add the oil to a large pot and heat over medium heat. Add the onion and season lightly with salt and pepper. 3. After the onions have cooked for a few minutes, and start to turn translucent add the carrots, fennel, and garlic and season with a touch more salt and pepper. 5. 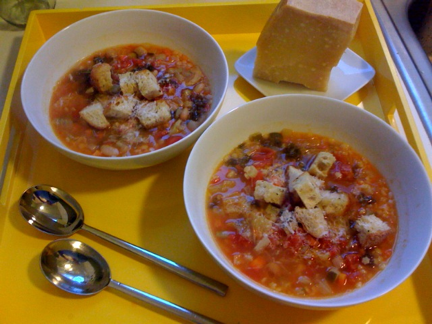 Once the vegetables are lightly cooked-through, add the cannellini beans, and tomatoes. Stir to incorporate, then add the organic low sodium chicken broth. NOTE: If you are not using low sodium broth, be sure to cut back on the amount of salt you are using to season the veggies. 6. Add the cayenne pepper and parmesan rind, stir to incorporate. 7. Bring to a boil, then lower heat and cover to simmer for at least 30 minutes. 2. Drizzle the cubes with olive oil, then season with the grated parmesan, salt, and pepper. Toss to coat evenly. 3. Place in the oven on the top rack for about 10-15 minutes. TIP: I’m notorious for forgetting about the bread, so I set the timer for 5 or 8 minute increments so I can remember to keep checking in. Once you get to know your oven, you can set it less often. No more burnt bread! – Add some pasta stars or alphabet letters. – Top with homemade pesto.